"Was there ever any doubt?" They used to watch in awe as Trixie performed. Nopony doubted Trixie's magic, but now they know the truth. Maybe The Great and Powerful Trixie isn't so great and powerful after all. Huge shout-out to ~TheGAndPTrixie and ~DDHyuugaman for helping me out with this one! Thanks so much, guys. Also, thank you to all the watchers that contributed their ideas to the making of this poster. You all motivated and inspired me to make and finish this. Maybe Trixie just doubted her magic abilities too much, and made the lie of vanquishing an Ursa Major up to make her feel better about herself. I know I've done similar things before. The expression I tried to give her on the right side is one of contemplation, and maybe regret and sadness. Just clearing that up. I'm not too sure about this poster, as I'm not too sure about some of my other posters. I don't know if this will impact people like some of my others have. But hey, I gave it a shot. Of course, I'm always willing to change some stuff in the poster if people will like it more. So if you have any suggestions, just let me know. Please ask me for permission before submitting this to other sites or using it in your own work! And don't forget to link back here! Do NOT trace over. 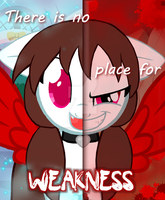 CLICK HERE FOR MORE TWO SIDES POSTERS! Thankfully she made friends with Starlight ... and if we count what happened in EG she is also friends with Sunset. Future is looking bring for the most greatest and most powerful . Trixie's good now people, she's now Starlight Glimmer's friend. WARNING! Carry on reading! Or you will die, even if you only looked at the word warning! Once there was a little girl called Clarissa, she was ten-years-old and she lived in a mental hospital, because she killed her mom and her dad. She got so bad she went to kill all the staff in the hospital so the -government decided that best idea was to get rid of her so they set up a special room to kill her, as humane as possible but it went wrong the machine they were using went wrong. And she sat there in agony for hours until she died. Now every week on the day of her death she returns to the person that reads this letter, on a monday night at 12:00a.m. She creeps into your room and kills you slowly, by cutting you and watching you bleed to death. Now send this to ten other people on this one site, and she will haunt someone else who doesn't. Stopped mid paragraph and my vitals are still going. ITS WAS THERE EVER ANY MAINE!!! Platinum Button: Twilight showed you up. The only way to become the great one you think you are is to accept it. Can you say the name of fonts, please? I love these artworks! I reckon they are masterpieces. An important and beautifully deep concept expressed so simply and elegantly. I wanna ask how you get the text? What's the font for the last word? I know, but there must be a font for it? Like, from dafont.com or something? I've loved these two-sided mlp for a while now and I have drawn some too. Problem is, I don't know how to animate it. May you please help me? Makes me a bit sad. There's one thing I don't doubt though - she's talented at failing. Fine. I'll just feign my complements and let her believe she has actual talent while she continuously gives a substandard performance. Wait....that actually sounds like a better way to see her suffer. Thanks! A rotten potato is more magical than her. Also, every unicorn can do magic. With that logic, wouldn't Twilight Sparkle be much better than her? 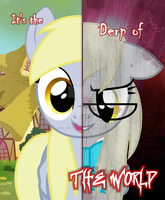 all im saying is that she is best pony. What I want to see is a sequel episode after the events of Magic Duel. Maybe Trixie will make up to Twilight and her friends. Trixie deserves more than hating fans and Twixie ship fics. I want more TRIXIE!!!! ok, i could feel sorry for her the first time she was a jerk, but the second time was just raw evil tyranny! she was evil before she put on the amulet. she bought it didn't she? so that she could use it to get revenge on twilight instead of just dropping it. that was her plan BEFORE the alicorn amulet "corrupted" her. I seriously doubt they'd have introduced it as a plot point that the amulet turned the user into its pawn and have Twilight note the radical shift in Trixie's personality and have Trixie apologize for her actions at the end of the episode if all together didn't mean something. Yeah, I suppose. But still. Jerk move. A friend of mine concluded that Trixie had ALREADY been corrupted by the Alicorn Amulet in part by the time she got to Ponyville. The theory goes Trixie originally had the sane goal of "prove I'm everything I said I was, and get my life back!" But the Alicorn Amulet revised that. I still think a bit of community service would make up for the enslavement. Don't know if you saw, but they put up friggin banners for her. The Alicorn Amulet is the Pony version of the One Ring IMHO.